The WE1S Research Blog is actually the category-page (archive-page) for a WordPress “custom-post-type” on the site called “Research Post”. To create a research post, choose “Research Posts” in the left sidebar of the WordPress editing dashboard (and not the regular “Posts”). (See screenshot below). Then write or edit as normal. Unlike regular posts, however, research posts have required fields for “publication author” and “publication date”. These are text strings that need not be the same as the post author and post date. So, for instance, one can put in for author “Alan Liu, Giorgina Paiella, and Tyler Shoemaker.” And one could put in for date “July 10, 2018; revised July 18, 2018)”. Though it is not clear in the editing view of a research post, you also need to go to the meta-box in the right sidebar for “Research Blog post types” and enter “Research Post” (or use the “Choose from the most used research blog post types” link for picking that post type). 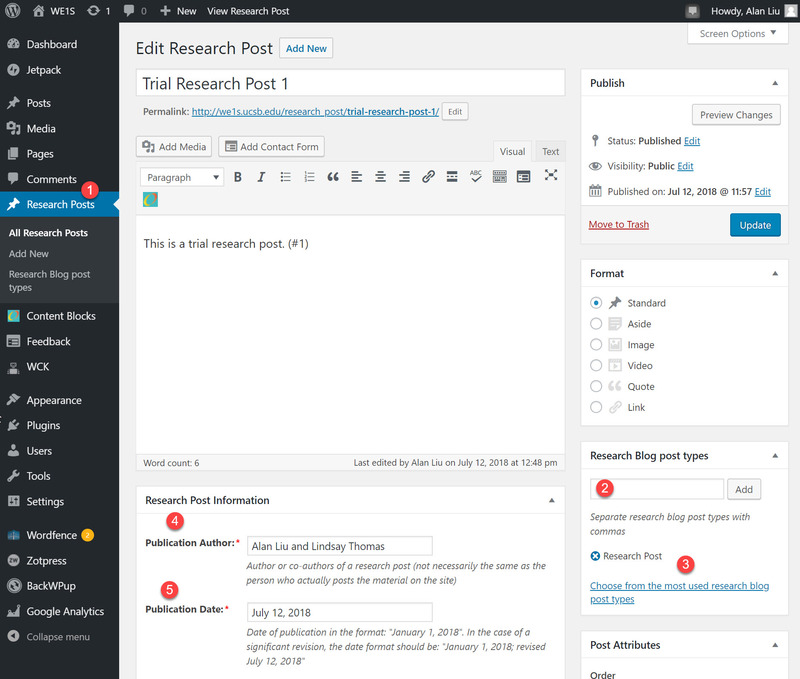 To create a research post, choose “Research Posts” in the left sidebar of the WordPress dashboard (different from regular “Posts”). Go to the meta-box for indicating the research blog post type, and enter “Research Post”. For convenience, use this link to choose the most used research blog post type. Fill in the required publication author field. Fill in the required publication date field.